Bullish looking stock trade idea. The chart says it all. Great overall pattern pressure. 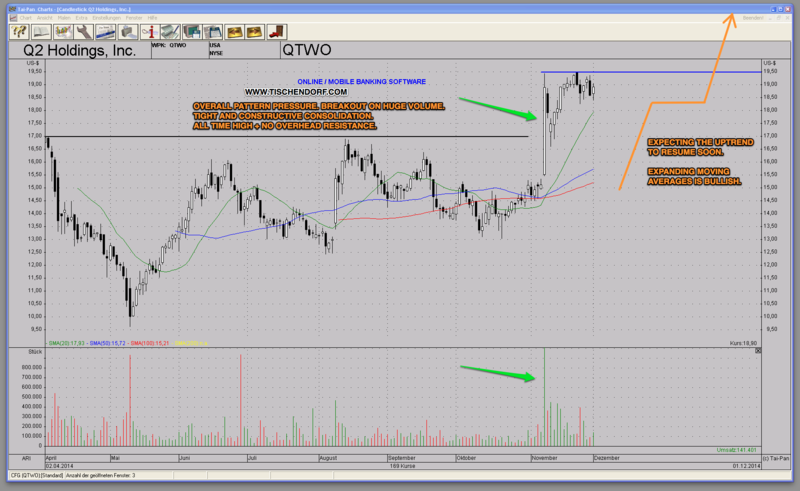 Then the earnings related break out to new all time highs on huge volume. Then the tight and bullish consolidation we are witnessing now. Odds are QTWO – Q2 Holdings will resume its new uptrend in ABC pattern fashion very soon. The main driver for higher prices should be the lack of overhead resistance. Q2 Holdings, Inc. provides cloud-based virtual banking solutions to regional and community financial institutions (RCFIs) in the United States. It offers Q2online, a browser-based virtual banking solution that delivers RCFI-branded virtual banking capabilities, such as account access, check balancing, funds transfers, bill pay, processing recurring payments, statement viewing, and new products and service applications; provides management functionality comprising account holder enrollment, password management, permissions, rights management, reports, and integrated security, as well as feature assignment for online, mobile, voice, and tablet banking; and supports single and batch ACH processing, payroll, state and federal tax payments, and domestic and international wires. The company also provides Q2themes for customizing virtual banking services through personalized themes, such as language preferences, font styles, and designs specific; and Q2mobility App to access, engage, and complete banking transactions, such as adding and managing payees, transferring funds, executing single or recurring payments, viewing e-statements or check images, and managing other general banking services through mobile and tablet devices. In addition, it offers Q2mobile Remote Deposit Capture, a partnered solution that allows remote check deposit capture; Q2text, a mobile solution, which enables virtual banking activities through the text messaging function of the device; Q2voice, a voice-based solution for telephones; Q2clarity, an analytics solution for Q2online customers; and Q2 Risk & Fraud Analytics, a security analytics solution for customers to detect and block suspect transactions in virtual banking solutions. Q2 Holdings, Inc. delivers its solutions using a software-as-a-service model. The company was formerly known as CBG Holdings, Inc. and changed its name to Q2 Holdings, Inc. in March 2013. Q2 Holdings, Inc. was founded in 2005 and is headquartered in Austin, Texas.